Garden Landscaping Tips and Design Inspiration! I wonder if you will agree with me on my view of residential gardens? On one extreme there are far too many builder installed, flat, uninteresting landscapes in the world. On the other hand, there are so many gardens stuffed with exotic plants, each tumbling over the other, and none endowing the landscape with any real magnificence. Beauty lost in the crowd. What I hope you get excited about is the kind of garden that there are way too few of! I dream of passing on my dream of upping the ante on the average residential garden. I want you to get excited about creating a garden that demands the full attention of every guest in your corner of the world. If you can really get a hold of a garden dream and resolve to pursue it with an unwavering passion, you will achieve your own private garden paradise. Take the plunge and get inspired! Show me some Examples of Rhythm and Motion! Click the photo for some garden landscaping tips about how rhythm and motion transform your garden into a dynamic garden space! Learn the Principles of Rhythm and Motion. Ideas for Designing Spaces with Impact! How to use Asymmetrical Balance to Create Interest! 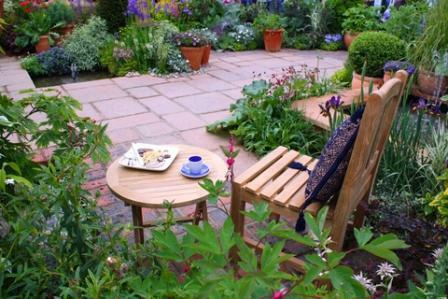 Love a slightly off kilter, charmingly diverse sort of garden space? Click the picture for some ideas about how to employ the design concepts of asymmetrical balance to your designs! Symmetrical Balance, a Key to Order. Use Color and Mood to Create Comfort! How many of us actually pay attention to the nuances of color when planning our gardens? Learn how to vary the mood of your garden through the use of color, texture and form. Is it Country, or is it Cottage? These two similar styles are often treated as though they are the same, but there are some very practical differences! Sharing the same roots, country and cottage styles have diverged until each represents a unique and separate style. Find out how they differ. The cottage garden style is among the favorites in today's world, and for good reason! This accommodating garden style is easy to achieve and easy to maintain. Discover how to bring cottage garden style home with you by clicking the photo above to access the style guide. The roots of the Formal English Garden can actually be traced back to the early Roman times. However, Formal English Gardens as we know them today originated during the 18th Century, from about the 1740's. Urban Gardening is almost more of a circumstance than it is a garden style, yet we do recognize and associate specific traditions and techniques with it. Gardens in the city take many forms dictated primarily by available space, existing light conditions, and access to water. Accordingly, urban garden style is a vast mix of other garden styles, dictated only by personal preference and the conditions available. Some folks who visit this site have gardened for years, others have only just picked up their first spade, but you all have something in common. You are here because you love to learn, and because you have enough interest in gardening to roam these pages for just a while. 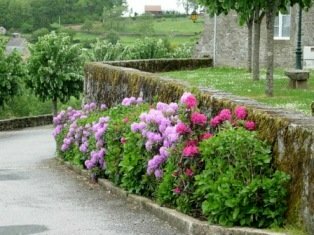 You want a picturesque garden. You love beautiful things and your gardens bring you genuine joy, whether they are already created or still in your head. Build a garden that respects the principles of design and yet is so alive with color, texture and spiritual essence that it can be classified only as a work of art! It’s easy to do, and it’s fun! The garden landscaping tips collected on these pages are designed to take you beyond the basics of design, into deeper discussions of elements of design that apply directly to your garden design choices. Read these pages, print them, take them into the garden with you, and apply these ideas with rigor. Use these garden landscaping tips to build the garden of your dreams!